As seen on ‘River Cottage’ and ‘Kirstie’s Homemade Home’. This egg skelter is a brilliant way of storing and displaying your fresh eggs in date order. Every time your hens lay a lovely egg simply add it to the skelter, and when it comes to eating them you will know to use the one at the front, which will always be the oldest. Your eggs will be proudly on display and you will never have to waste one again! Suitable for 20 medium to large sized eggs. Give your chickens more space while keeping them safe with a Walk in Chicken Run from Omlet. New and improved, this range of Walk in Runs look great whilst blending into the garden and they are designed to work with any kind of chicken house or chicken coop. The Lenham Chicken Coop is designed to provide spacious accommodation for up to 12 chickens. Its simple design offers ease of maintenance and great access. Bring your kitchen to life with the Egg Ramp™, a stylish new way to store eggs and keep them in date order. Available in great colours to suit any kitchen. Every time your hens lay a lovely egg, simply add it to the shiny melamine Egg Ramp™. When it comes to using them, always use the one at the front first, which will be the oldest – no more guesswork. At only 15cm deep it looks sleek and it won’t take up much space on your worktop. There are several colours to choose from so you can be sure to find one that will suit your kitchen, and your personality, perfectly! he Egg Ramp™ can hold up to 12 medium chicken eggs. If your hens eggs are a bit bigger or smaller it doesn’t matter, the Egg Ramp™ can handle them! The gap between the sides is 3cm, so unless your eggs are the size of Maltesers they won’t fall through, making the Egg Ramp™ ideal for bantam eggs as well! You will of course be able to store lots more than 12 of them… pretty hendy if you have a whole flock in your garden! The simple, stylish, straightforward way to start keeping chickens. The Eglu Go is the latest in the Eglu range and keeps up to 4 medium size chickens happy and healthy. The Eglu Go comes complete with everything you need to get started. It has plastic roosting bars and a discreet nesting area which can be filled with straw or shredded paper to make a comfortable nest for your chickens. The freshly laid eggs can be plucked from the nest simply by opening the door at the back and can be served with some buttery soldiers in a matter of minutes – delicious! You’ll find keeping your Eglu Go in tip-top condition a breeze thanks to its innovative slide-out dropping tray and wipe clean surfaces. The optional (yet recommended) standard 2m run is made from strong steel weld mesh, virtually impossible for predators to break. A unique anti-tunnel skirt sits flat on the ground and prevents animals from digging in. The run has spacious vertical sides and gives your chickens plenty of room. You can extend the run in 1m sections if you wish. The Eglu can be positioned on grass or any other surface such as wood chippings or rough ground where the chickens can rummage. The unique tunnel-proof panels have been proven in rigorous testing to be fox and badger resistant. The run means that when you are out and about you can be sure that your chickens are safe. The dark green coating is fused to the metal wires ensuring an extremely durable finish that looks great in the garden. The Eglu is everything you need and want from a chicken house. Offering a standard of living not seen before in chicken house design, it is fitted throughout with a slatted floor that allows droppings to fall cleanly away protecting your chickens from walking on a soiled floor. The integrated nest box is comfortably curved in all the right places to provide a cosy place to lay eggs. To make collecting your eggs easy, the Eglu Classic has an eggport which you can open from the outside giving instant access to the nesting area. Routine upkeep of this fantastic chicken coop is a simple 5 minute task thanks to the slide-out dropping tray and fully removable lid. You can also be sure of the time and money saving benefits of owning an Eglu because it’s made from modern energy-efficient polymers that never need to be treated. The Eglu Classic is naturally weather resistant and will last for years. At the end of it’s life it can be 100% recycled. Find out how the Beehaus works and see inside a colony of bees based on a London rooftop. If you are considering getting a colony of bees then a Beehaus is a great way to get started. The Beehaus has been designed to make it easier and more relaxing to manage your colony. The good working height make lifting the frames and boxes very easy. The Beehaus is essentially two hives in one, which gives you the space to manage a colony through the year and the ability to divide the colony in two for swarm control. The Beehaus comes complete with everything you need to get started. The Boughton is our best selling traditional chicken house and provides comfortable accommodation for up to six chickens. It is the ideal solution for the first time keeper. The Boughton is specifically designed for bantams and medium-sized birds. The Chicken Swing has Landed! Following its huge success in the USA, The Chicken Swing has finally landed at Omlet, and it’s ready to bring fun to all our feathered friends. All chicken keepers know that birds love to perch and they will hop on to anything they can lay their feet on to give them a good view of the world. 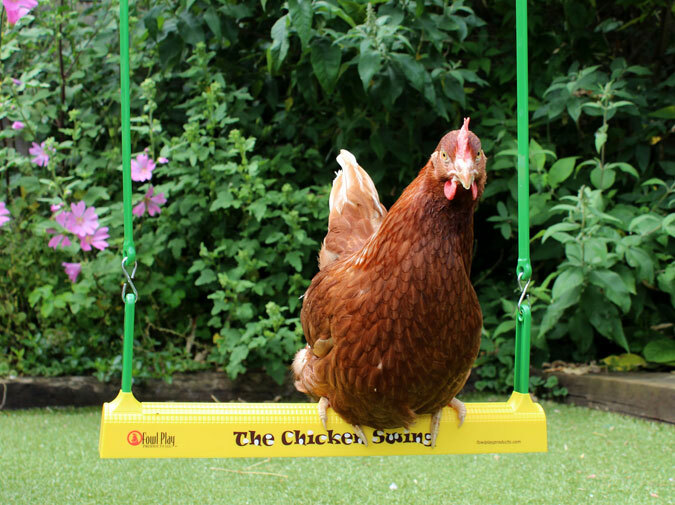 The Chicken Swing provide more than just a place to perch though – it actually swings! Ideal for hanging in any chicken coop, enclosure or run, The Chicken Swing will reduce boredom and keep your pets hentertained. They’ll love being able to hop up as they please, stretch their wings and swing back and forth above their pals. The Chicken Swing is suitable for poultry of all ages and breeds and it is a fantastic accessory for every chicken keeping area. You are sure to henjoy watching your pets in action as much as they enjoy using it! Order your Chicken Swing today for £19.99!